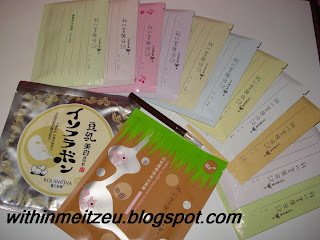 I received my parcel of masks on Wednesday. Purchased those mask from Princess Street. Overall the price that I paid for all the below masks was cheap compared to the same products sold in Guardian and even Watson! In addition, they free me a mask & a eyeliner/brown/lip pen. I've use the mask for few consecutive days which i really needed those mask to rejuvenate my facial moisture and the "polluted" skin. DARN... girls really had lots of things to care... From head to toes. I was having fun with my elder sister's colourful ribbons which from Australia (If I'm not wrong) and local ribbons. She didn't use for years and kept them apart, that's why I used it for D.I.Y. 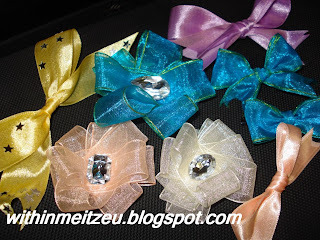 AND the below ribbons was made by me!! Hmm... Any other easy DIY can be done? Any recommendation?